Reference number for this case: 15-oct-54-Perpignan. Thank you for including this reference number in any correspondence with me regarding this case. BANGKOK, Oct. 16 (INS). -- Thailand which has been feeling ignored by interplanetary visitors - heaved a sign of relief today after a flying saucer was sighted over Bangkok. Bangkok newspapers, quoted by Agence France Presse, not only hailed the sighting of a saucer over their city "at last," but declared that "available information reveals that uninvited guests from outer space ... are directing their attention here with a friendly attitude towards the people of Bangkok." PERPIGNAN, France, Oct. 16 (INS). -- A retired French customs man today reported he saw a flying saucer land and a tall man dressed in "a diver's suit" step out. 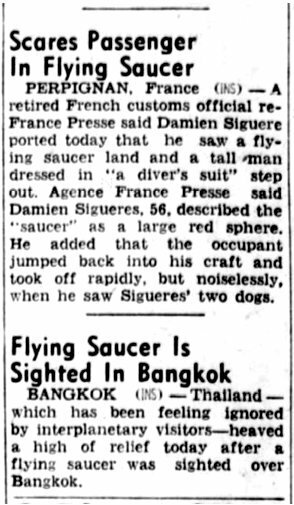 Agence France Presse said Damien Siguère, 56, described the "saucer" as a large red sphere. He added that the occupant jumped back into his craft and took off rapidly, but noiselessly, when he saw Siguere's two dogs. PERPIGNAN -. Until yesterday it had not been given to us to have an affirmative testimony of the passage of the "flying saucers" in the area of Perpignan. However yesterday evening we learned that an inhabitant from the district of St-Assicle, a man who appears perfectly balanced and worthy of faith, Mr. Figuères Damien, retired Customs officer, 56 years old, living 27, street of Guarrigole, affirmed to us that Thursday evening, around 07:50 p.m., he had seen on the road, close to the camp-site of the swimming pool, at the intersection of the crossing which joined the road of Prades, a large red ball. From it; which landed in the middle of the road, a large man, dressed like a diver, came out, then walked all around his apparatus, and returned hurriedly inside having seen Mr. Figuères' two dogs arriving. Taking off without making the least noise and without spitting the least flame, the craft disappeared in the sky at an extraordinary speed. Mr. Figuères who was about thirty meters approximately of the sphere, rushed home, 150 meters from the place of landing of the machine, alerted his son-in-law Mr. Lissoni, driver at the service of Mr. Dot, shipper, and both reconsidered the spot but they found no trace neither on the ground, nor even on the electric or telephone wire which frame the crossroads, forming a square inside which the machine had to land. Mr. Damien Figuères indicates to our photographer the place where, he affirms, he saw the mysterious machine land. Mr. Figuères was then at the place occupied on our photograph by a cyclist. ROME. - Many mysterious craft were sighted yesterday in the Italian sky. One of these craft landed near Rovigo, in the so-called place Po di Gnocca area, where several people observed it. The apparatus of circular shape after slowly hovering, landed on the ground without a sound. After being motionless a few minutes, it resumed its flight, vertically and silent, but at the place where it had taken off, there is now a fairly deep crater, six meters in diameter. Six poplar that grow there were also charred. The authorities will go to the scene to verify the authenticity of eyewitness accounts. Around Modane, a trader saw a glowing "flying cigar" fly at two hundred meters in altitude. After a brief stop, the apparatus reportedly wen to the northwest. This observation was confirmed by other witnesses. Finally, a shimmering silver "flying saucer" flew over the area of Luine at 5,000 meters. Witnesses of this observation stated that the "saucer" did not make any noise and emitted no smoke. It disappeared in the direction of Switzerland. Perpignan. -- Mr. Damien Siguères, 58-year-old, a retired Customs officer stated to have seen on the road near his home in the suburbs of Perpignan, a large red sphere. From this, came a tall man, dressed like a diver. Having toured the apparatus, the "diver" rushed back inside as the Mr. Siguères' two dogs rushed toward him. The craft then rose silently and disappeared at a prodigious speed. Mr. Siguères was then about thirty meters of the craft, of which no traces were found on the ground. PERPIGNAN. -- Mr. Damien Siguères, 56-year-old, retired customs officer, stated to have seen on the road, close to his home, in the suburbs of Perpignan, a large red sphere. From it left a big man, dressed like a diver. Having walked around his craft, the "diver" hurriedly got back inside while Mr. Siguères' two dogs rushed towards him. The craft then rose without noise and disappeared at an extraordinary speed. Mr. Siguères was then at about thirty meters of the craft, of which no trace was found on the ground. M. Damien Siguères, 56 years old, retired customs officer, stated to have seen on the road, close to his home, in the suburbs of Perpignan, a large red sphere. A tall man came out of it, dressed like a diver. Having made a tour of his apparatus, the "diver" went back inside hurriedly while Mr. Siguères' two dogs were rushing towards him. Mr. Damien Siguère, aged 56, retired customs officer, stated to have seen on the road, close to his residence, in the suburbs of Perpignan, a large red sphere. From it, left a tall man, dressed like a diver. Having made a rour around his craft, the "diver" went back in there hurriedly, while Mr. Siguère's two dogs rushed towards him. The craft then rose without noise and disappeared at an extraordinary speed. PERPIGNAN, France (INS) -- A retired French customs official reported today he saw a flying saucer land and a tall man dressed in "a diver's suit" step out. Agence France Presse said Damien Sigueres, 56, described the "saucer" as a large red sphere. He added that the occupant jumped back into his craft and took off rapidly, but noiselessly, when he saw Sigueres's two dogs. BANGKOK (INS) -- Thailand - which has been feeling ignored by interplanetary visitors - heaved a sigh of relief today after a flying saucer was sighted over Bangkok. 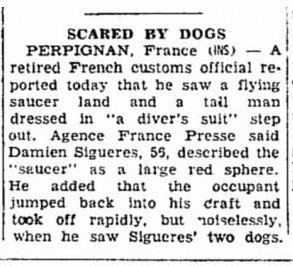 PERPIGNAN, France (INS) -- A retired French customs official reported today that he saw a flying saucer land and a tall man dressed in "a diver's suit" step out. Agence France Presse said Damien Sigueres, 56, described the "saucer" as a large red sphere. He added that the occupant jumped back into his craft and took off rapidly, but noiselessly, when he saw Sigueres's two dogs. This Should End Saucer Stories! 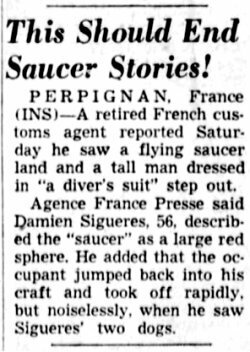 PERPIGNAN, France (INS) -- A retired French customs agent reported Saturday he saw a flying saucer land and a tall man dressed in "a diver's suit" step out. Agence France Presse said Damien Sigueres, 56, described the "saucer" as a large red sphere. He added that the occupant jumped back into his craft and took off rapidly, but noiselessly, when he saw Sigueres's two dogs. 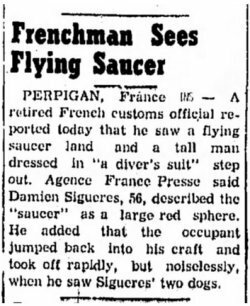 PERPIGNAN, France (INS) -- A retired French customs official reports that he saw a flying saucer land and a tall man dressed in "a diver's suit" step out. Agence France Presse said Damien Sigueres, 56, described the "saucer" as a large red sphere. He added that the occupant jumped back into his craft and took off rapidly, but noiselessly, when he saw Sigueres's two dogs. The author indicates that on October 14, 1954, a customs officer at Perpignan in France, testified on oath that a strange reddish object landed near him, and that a man in a sort of "space suit" came out of it. The man was apparently scared by barking dogs and climbed back and took off at fantastic speed. Further in the book, he mentions that in November 1954, Saucer entities buzzed off from barking dogs, at Perpignan. At Perpignan retired French Custom Official Damien Siguères saw a flying saucer land and a tall man dressed in a diver's suit get out of the craft. 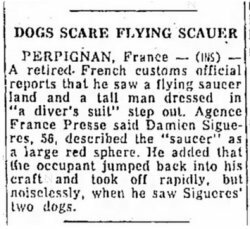 But the man jumped back into the saucer and took off when he saw M. Sigueres's two dogs. This saucer was described as a large red sphere. Oct. 15, 1954, Perpignan (France). Near the swimming pool in Saint-Assiscle, Damien Figueres, 56, was walking with his dogs when a reddish, luminous sphere landed 30 m away and an individual in a diving suit walked around it. The dogs barked at him. He boarded the machine, and it flew away in silence. 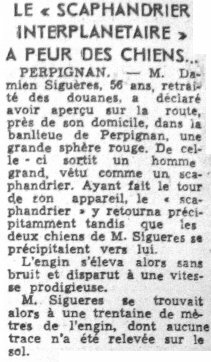 (Paris-Presse, France-Soir, 17 oct 1954, Carrouges 120). The author indicates that on October 13, 1954 in Perpignan, Mr. Figuère, pensioner, 76 years old, saw, posed at less than 30 meters of him a "large illuminated reddish sphere", from which a "Martian" dressed like a diver came out, and quickly walked around the craft, went up on board, and took off. Near the swimming-pool at Saint-Assicle, Monsieur Damien Figuères was walking with his dogs when a reddish luminous sphere landed 30 metres from them and an individual in a "diving-suit" emerged and walked around it. The dogs barked at him. He then re-entered the craft, which took off silently. Jacques Vallée: Case No. 261 of A century of Landings, in Lumières Dans la Nuit, No 102 (October 1969) and Passport to Magonia. The two authors indicate that on October 13, 1954 in Perpignan, Mr. Figuéras [and not Figuères] a 76 years old pensioner [and not 56], sees a landed reddish luminous sphere, at about thirty meters of him. A small character equipped as a diver comes down from the craft. He walks around the sphere and goes up on board. The craft takes off at once. Mr. Figuéras noticed that the dogs of the vicinity barked furiously during all this scene. The two authors indicate that in Perpignan on October 15, 1954, a person is in front of his residence, close to the swimming pool of Saint-Assiscle and walks his two dogs. He then sees a reddish sphere which is posed on the road. Fron this object emerges a big man, dressed like a diver. Having walked around his apparatus, the pilot quickly goes back in there, while the two barking dogs leap towards the object. The object then rose without noise and disappeared at an extraordinary speed. The witness was at about thirty meters of the apparatus. No traces were found on the road. The authors indicate that the sources are case 261 of the Vallée catalogue; Michel Carrouges in "Les Apparitions de Martiens" page 120; C. Garreau and R. Lavier in "Face aux E.T." page 172; le Provençal for 10/17/1954; la Montagne for 10/18/1954; Paris-Presse and France-Soir for 10/17/1954. According to an article in the ufology magazine OVNI Présence #33-34 of December 1985, the sighting explains as a "slow meteor" seen "all over France and elsewhere." Ufologist and author Jean Sider refers to the article of the newspaper "L'Indépendent of October 16, 1954, to specify that at the time of the incident of October 14, 1954 at 07:30 P.M. in Perpignan, one of the dogs of Mr. Damien Figuères who was an Alsatian, had barked at the object landed in the middle of the road, and that his two dogs had rushed in the direction of the object. 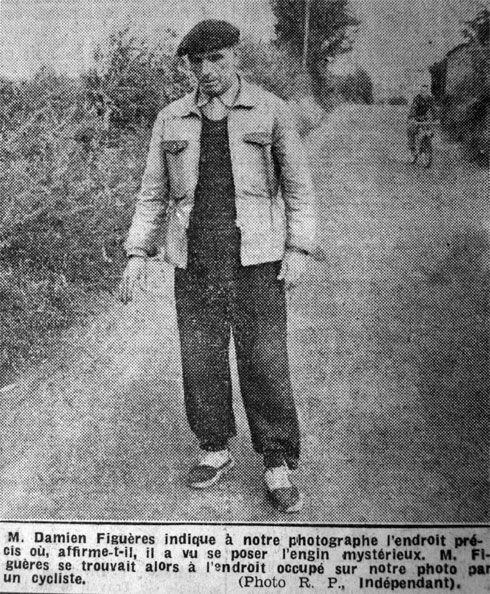 The Belgian ufologist indicates that on October 15, 1954 in France in Perpignan, Damien Figuères walked with his dogs not far from the swimming pool of St-Assiscle, when a reddish sphere lands and a tall being, dressed like a diver, walked around it. The dogs barked after him. He went up on board the machine which flew away silently. The sources are indicated as Jacques Vallée: "Chronique des apparitions ET", Denoël 1972, J'Ai Lu collection, p. 282. The ufologist adds that in reality, according to OVNI Présence #33/34 Dec. 1985, it was a "slow meteor" seen on all France and elsewhere. Retired French customs man Damien Figueres, 56, reported he saw a large red sphere land, and a tall man dressed in a "diver's suit" step out. The occupant jumped back into his craft and took off without sound when he saw Figuere's two dogs. 1954 – Near the community swimming pool in Saint-Assiscle, Perpignan, France Damien Figueres, age 56, was walking with his dogs when a red luminous sphere landed 30 meters away. A humanoid being in a diving suit got out and walked around it. The dogs barked at him. The being then boarded the craft and it flew away in silence. (Source: Jacques Vallee, Passport to Magonia: A Century of Landings, p. 229). Jordi Ardanuy summarizes the whole of the sources which I published in this file in date of 2006; the references indicate that it comes from my page. He then comments on that "all the information on the case is dubious", that there is neither agreement on the name nor agreement on the date, that on October 14, 1954, what was probably a slow meteor was seen in several place of France and thus the case is certainly a divagation around an original testimony on the slow meteor; although my file said it was a "Probable hoax by the two journalists of 'Samedi Soir'". In Perpignan (France), Damien Figuères (56 years old) walks with his dogs not far from the swimming pool of Saint-Assiscle, when a reddish luminous sphere lands at 30 m and 1 being dressed like a diver walks around it. The dogs bark after him. He climbedon the apparatus which flies away silently. Jérôme Beau indicates that the sources are Paris-Presse, France-Soir, 17 octobre 1954, and "Carrouges, M. 120". The website indicates that on 15 October 1954 in Perpignan, France, "Near swimming pool a man was walking his dogs when red luminous sphere landed 30 m away, entity in diving suit walked around it. Dogs barked. Entity boarded, flew away silently." The website adds: "Close encounter with a an unidentified craft and its occupants. One red sphere, around 100 feet away, was observed by one male 56-year-old witness in a yard (Figueres, D). No sound was heard. One tall being, wearing a diver's suit, was seen." And: "Retired French customs man Damien Figueres, 56, reported he saw a large red sphere land, and a tall man dressed in a "diver's suit" step out. The occupant jumped back into his craft and took off without sound when he saw Figuere's two dogs." The sources are indicated as Webb, David, HUMCAT: Catalogue of Humanoid Reports; FSR, FSR (formerly Flying Saucer Review), FSR, London, 1966; Bowen, Charles, The Humanoids: FSR Special Edition No. 1, FSR, London, 1966; Wilkins, Harold T., Flying Saucers Uncensored, Citadel, 1955; Pereira, Jader U., Les Extra-Terrestres, Phenomenes Spatiaux, Paris, 1974; Vallee, Jacques, A Century of Landings (N = 923), (in JVallee04), Chicago, 1969; Schoenherr, Luis, Computerized Catalog (N = 3173); Carrouges, Michel, Les Apparitions de Martiens, Fayard, Paris, 1963; Delaire, J. Bernard, UFO Register Volume 7 (1976), Data Research, Oxford, 1976; Newspaper Clippings; Rosales, Albert, Humanoid Sighting Reports Database. The website indicates that on 15 October 1954 in Perpignan, France, "A reddish, luminous sphere landed 30 meters away and an individual in a diving suit walked around it." And: "Near the community swimming pool in Saint-Assiscle, Perpignan, France Damien Figueres, age 56, was walking with his dogs when a red luminous sphere landed 30 meters away. A humanoid being in a diving suit got out and walked around it. The dogs barked at him. The being then boarded the craft and it flew away in silence." And: "Near the swimming pool in Saint-Assiscle, Damien Figueres, 56, was walking with his dogs when a reddish, luminous sphere landed 30 meters away and an individual in a diving suit walked around it. The dogs barked at him. He boarded the machine, and it flew away in silence." And: "One red ball was observed." The source is indicated as "Vallee Magonia Database". The website indicates that on 14 October 1954 at 19:50 in St Assiscle, France, "Luminous ovoid descends. Man in diving suit exits. Dogs bark. UFO takes off, no sound. Close encounter with a an unidentified craft and its occupants. One ovoid object was observed by one witness. No sound was heard." The sources are indicated as Vallee, Jacques, Computerized Catalog (N = 3073); Vallee, Jacques, Challenge to Science: The UFO Enigma, Henry Regnery, Chicago, 1966; Vallee, Jacques, Preliminary Catalog (N = 500), (in JVallee01); Hatch, Larry, *U* computer database, Author, Redwood City, 2002. Near the swimming pool in St-Assiscle, Damien Figueres (56) was walking with his dogs when a reddish luminous sphere landed 30m away and an individual wearing a diving suit walked around it. The dogs barked at him. He boarded the machine, which flew away in silence. Vallee case 261 citing Paris Presse + France-Soir 17 October 1954 + Carrouges 1964, p.120. Retired French customs man Damien Figueres, 56, reported he saw a large red sphere land, and a tall man dressed in a “diver’s suit” step out. The occupant jumped back into his craft and took off without sound when he saw Figuere’s two dogs. *Oct. 15, 1954 – Near the community swimming pool in Saint-Assiscle, Perpignan, France Damien Figueres, age 56, was walking with his dogs when a red luminous sphere landed 30 meters away. A humanoid being in a diving suit got out and walked around it. The dogs barked at him. The being then boarded the craft and it flew away in silence. (Source: Jacques Vallee, Passport to Magonia: A Century of Landings, p. 229, case # 261; Michel Carrouges, Les Apparitions de Martiens, p. 120). The author indicates that on October 14, 1954, at 7:30 p.m. in Perpignan, Damien Figuères, 56 years old, retired from the customs, on the road of St Prades, district St Assicles close to the camp-site of the swimming pool, saw a large red ball land in the center of the roadway. A great man dressed like a diver came out, made a tour of his apparatus and returned inside hurriedly when seeing the two dogs of the witness rush towards him. One of the dogs had barked before in direction of the object. Then the machine takes off and disappears. The sources are indicated like as L'Indépendant for October 16, 1954, Michel Figuet and Jean-Louis Ruchon in Le Premier Dossier des Rencontres Rapprochées en France, pages 168-169, and Jean Sider in Le Dossier 1954 et l'Imposture Rationaliste on page 202. This database recorded the case 14 times! Not looked for yet. Probable hoax by the two journalists of "Samedi Soir". [de1] Article in the newspaper Derby Evening Telegraph, Derby, Eire, October 14, 1954. [li1] Article in the regional newspaper L'Indépendant, France, October 16, 1954. 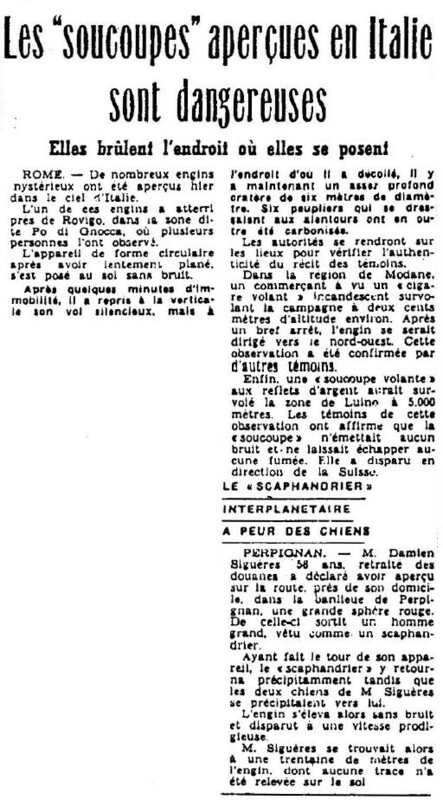 [es1] Article in the regional newspaper L'Espoir, Nice, France, October 16, 1954. 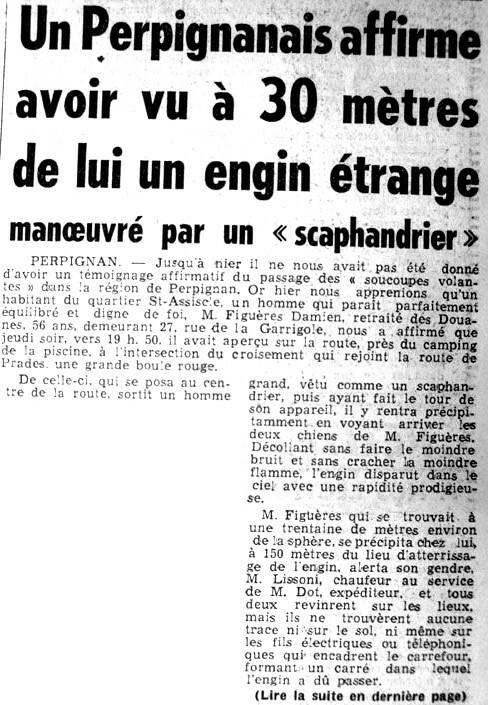 [---] Article in the local newspaper L'Indépendant, Perpignan, France, pp 1-8, October 16, 1954. [lm1] Article in the regional newspaper Le Méridional, France, page 4, October 17, 1954. [---] Article in the national newspaper France-Soir, France, October 17, 1954. [---] Article in the national newspaper Paris-Presse, France, October 17, 1954. [qh1] Article in the regional newspaper Le Quotidien de la Haute-Loire, France, October 18, 1954. [---] Article in the regional newspaper La Montagne, France, October 18, 1954. [dt1] Article in the foreign newspaper The Daily Times, New Philadelphia, Ohio, USA, page 6, October 18, 1954. [dd1] Article in the foreign newspaper The Delphos Daily Herald, Delphos, Ohio, USA, page 1, October 18, 1954. [td1] Article in the foreign newspaper The Tyrone Daily Herald, Tyrone, Pennsylvania, USA, page 2, October 18, 1954. [ab1] Article in the foreign newspaper The Akron Beacon Journal, Akron, Ohio, USA, page 2, October 19, 1954. [ld1] Article in the foreign newspaper The Lebanon Daily News, Lebanon, Pennsylvania, USA, page 16, October 28, 1954. [hw1] "Flying Saucers Uncensored", book by Harold T. Wilkins, Pyramid Books publisher, U-K., pages 246,248, 1954. [mc1] "Les Apparitions de Martiens", book by Michel Carrouges, (aka Louis Couturier), Fayard publisher, France, pages 80,120, 1963. [mc1] "Aparecen Los Marcianos", book by Michel Carrouges, (aka Louis Couturier), Spanish version of "Les Apparitions de Martiens", Pomaire publisher, Spain, page 159, 1967. [jv1] "Passport to Magonia - On Ufos, Folklore, and Parallel Worlds", book by Jacques Vallée, Contemporary Books publisher, USA, 1969. [---] "The Age of Flying Saucers: Notes on a Projected History of Unidentified Flying Objects", book by Paris Flammonde, Hawthorn Books publishers, USA, 1971. [jv1] "Chronique des Apparitions Extra-terrestres", French translation of "Passport to Magonia", book by Jacques Vallée, Denoel publisher, France, page 278, 1972. [jv1] "Pasaporte a Magonia", book by Jacques Vallée, Spanish version of "Chronique des Apparitions Extra-terrestres", Plaza y Janes publishers, page 267, 1972. [---] "Les Extra-Terrestres", booklet by Jader U. Pereira, Phénomenes Spatiaux, GEPA, France, 1974. [gl1] "Face aux Extra-Terrestres", book by Charles Garreau and Raymond Lavier, Delarge publisher, J'ai Lu, France, page 163, page 172, 1975. [jv5] "Catalogue préliminaire de 500 observations", listing in "Les Phénomènes Insolites de l'Espace", book by Jacques and Janine Vallée, Robert Laffont publisher, France, page 250, 1978. [fr1] "OVNI, Premier Dossier Complet des Rencontres Rapprochées en France", book by Michel Figuet and Jean Louis Ruchon, Alain Lefeuvre publisher, France, pp 168-169, 1979. [---] "HUMCAT: Catalogue of Humanoid Reports", compiled by David F. Webb and Ted Bloecher, Center for UFO Studies (CUFOS), USA, circa 1978. [---] Article in the ufology magazine OVNI-Présence, #33-34, December 1985. [js1] "Le Dossier 1954 et l'Imposture Rationaliste", book by Jean Sider, Ramuel publisher, France, page 255, 1997. [jg1] "RR3 - Le Dossier des Rencontres du Troisième Type en France", book by Julien Gonzalez, Le Temps Présent publishers, France, page 136, 2014. 0.1 Patrick Gross October 26, 2003 First published. 1.1 Patrick Gross April 20, 2009 Additions [mc1], [go1], [dj1], [jb1], [ud1]. 1.2 Patrick Gross March 7, 2010 Addition [ja1], [lm1], [ud2], [ud3]. 1.3 Patrick Gross June 29, 2010 Addition [jv5]. 1.4 Patrick Gross August 14, 2013 Addition [pr1]. 1.5 Patrick Gross September 24, 2014 Additions [es1], [ta1], [ni1]. 1.6 Patrick Gross October 11, 2016 Additions [li1], [jg1]. 1.7 Patrick Gross October 17, 2016 Addition [lp1]. 1.8 Patrick Gross December 8, 2016 Additions [gb1], [ub1]. 1.9 Patrick Gross September 20, 2017 Additions [dt1], [dd1], [td1], [ab1], [ld1].